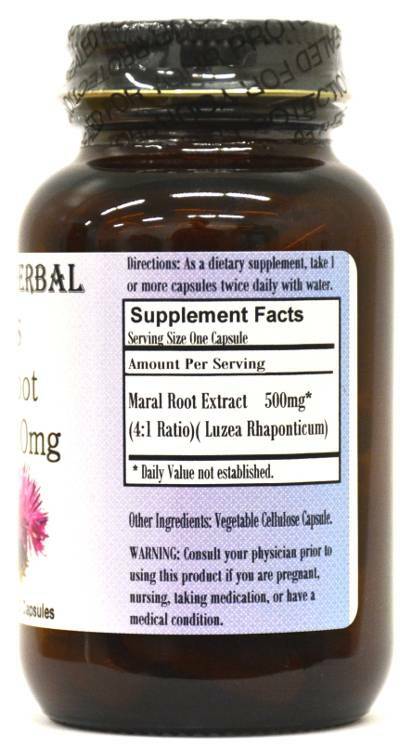 Barlowe's Herbal Elixirs now offers a 4:1 Maral Extract. Maral (Rhaponticum Carthamoides) is an adaptogen which has traditionally been used for fatigue, impotence and recovery from long illness. Research indicates that Maral may increase working capacity of tired skeletal muscles, as well as anabolic and muscle building processes. Bottled in Glass! No Stearates! No Fillers! No Junk! 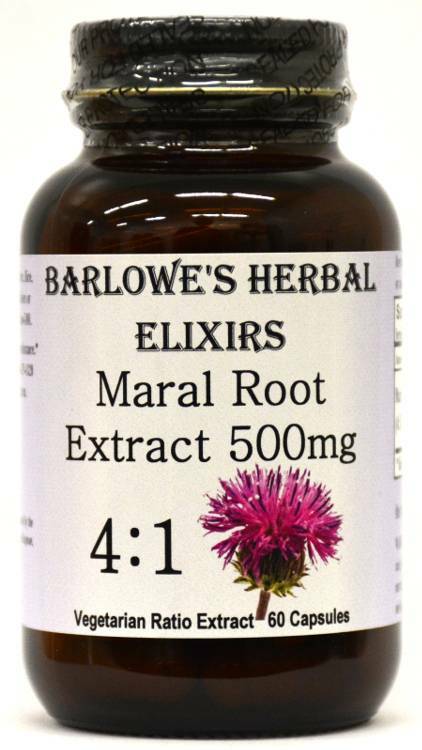 Barlowe's Herbal Elixirs now offers a 4:1 Maral Extract. Maral (Rhaponticum Carthamoides) is an adaptogen which has traditionally been used for fatigue, impotence and recovery from long illness. 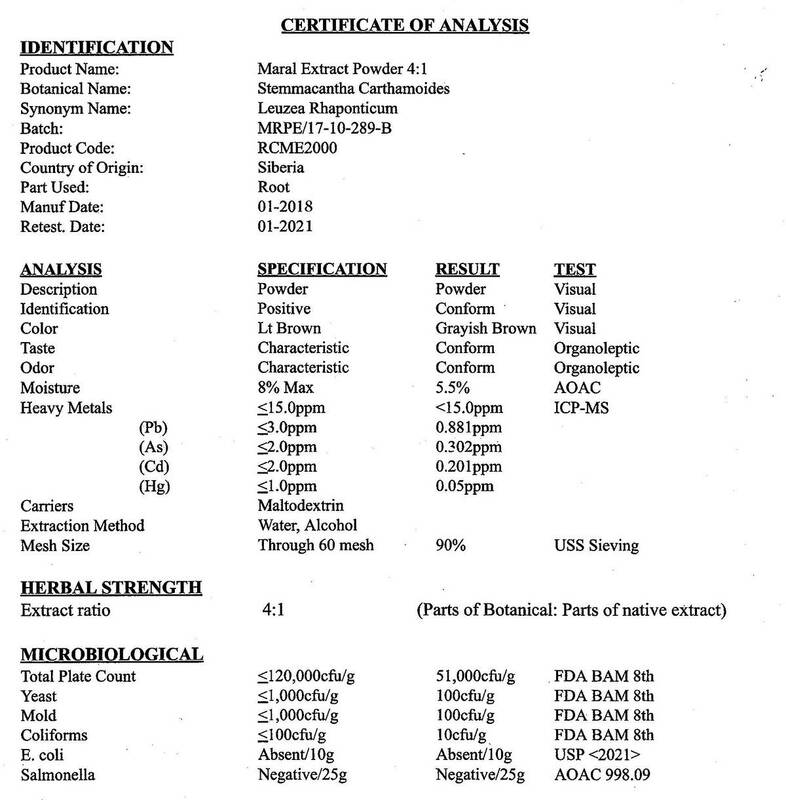 The Maral Certificate of Analysis (COA) for this particular batch is shown above. Research indicates that Maral may have a beneficial effect on memory and learning, increasing working capacity of tired skeletal muscles, as well as on anabolic and muscle building processes. Maral works by increasing protein to muscle synthesis. Bottled in Glass! No Stearates! No Fillers! No Junk! Maral contains a number of anti-oxidant flavonoids and natural sterols, including a substance called 20-Hydroxyecdysone, which have been shown to increase protein synthesis and enhance the production of muscle tissue. Research conducted in Russia shows that extracts of Maral can significantly increase muscle mass, while decreasing body fat in athletes who use it in exercise programs. Research also shows that Maral Extract can help to increase work capacity and endurance, while reducing mental and physical fatigue. Additional scientific studies performed on Maral have shown that this herb improves overall physical performance, and shortens recovery time after an intense workout. Observations of the influence of Maral on the cardiovascular system have shown that its ability to increase physical work capacity is partially due to its ability to improve food supply to the muscles and brain. One study of 60 military cadets using Maral Extract documented an improvement in appetite, sleep, and general physical health. In athletes who use Maral regularly, it demonstrates a marked anabolic effect, and aids the body in the synthesis of protein. Maral also appears to protect the body from environmental stress. Maral is prescribed to athletes by Russian sports physicians in order to replenish depleted physical reserves that become exhausted as a result of hard training. After taking Maral Extract, an increase in muscle mass and a decrease in fat tissue has been documented by researchers. Caution: Barlowe's Maral Extract is generally safe, but it is potent and should be utilized with care. This product is for dietary use. If unexpected side-effects occur, discontinue use immediately! The above statements have not been evaluated by the Food and Drug Administration (FDA). This product is not intended to diagnose, treat, cure, or prevent any disease. Directions For Use: Take two or more capsules daily. Serious bodybuilders may get best results by taking a large dosage with a high protein shake or snack right after a workout. For some people, dosage may need to be increased as results and usage amounts vary based on body type and weight.